Kyle Katarn, we miss you. These are disappointingly barren times for Star Wars games: only two Battlefronts (and a mobile game) have been released since EA acquired the licence back in 2013. Earlier this week, too, it was rumoured that the company's open world project had been killed, following the earlier cancellation of Visceral's Ragtag project. This is all happening during the peak of 21st century interest in Star Wars. I hoped we'd be drowning in new Star Wars games by now, and reader, we are not. There are numerous missed opportunities here—though I'm looking forward to Respawn's Jedi: Fallen Order. Nightdive Studio, which remastered games like System Shock and Turok for PC and is currently working on the System Shock remake, wants to help in our hour of need. The studio's CEO Stephen Kick took to Twitter a couple of days ago to express interest in giving a remaster treatment to 1995's Dark Forces. 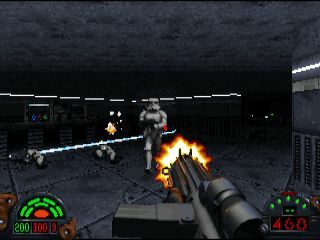 Dark Forces was a high point of '90s FPS games that followed Doom, introducing us to Kyle Katarn, who'd go from being a Han Solo-esque mercenary figure in this first game to Force user in the Jedi Knight games—which is quite a transition to make, really. It's unclear how EA's licence to make Star Wars games would affect a remaster of an older game. We'll keep you updated if anything becomes of it. My dad got stuck in Dark Forces' sewer level for ten years, and I still see those dianoga in my nightmares sometimes.